This weekend, my Forester went in to Williams Subaru to get some work done under warranty. Because they wouldn't be able to get to it until Monday, I got a loaner. I had a choice between a Legacy, Forester, and an XV. 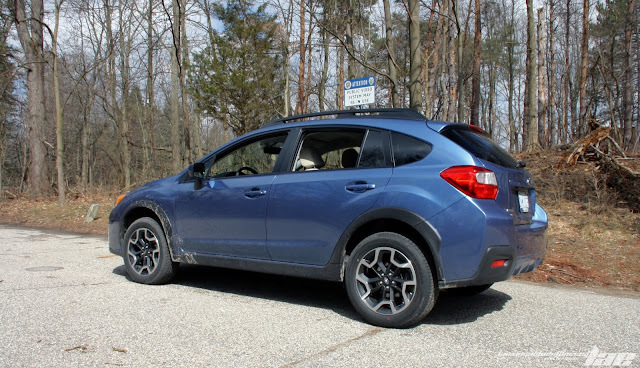 I'd never driven the XV, so I chose that. The Subaru Crosstrek fills the gap between the Impreza family Sedan, and the Forester Full-Size Crossover SUV. This one, a 2017 2.0i Premium, starts at about $23,000 before any options. 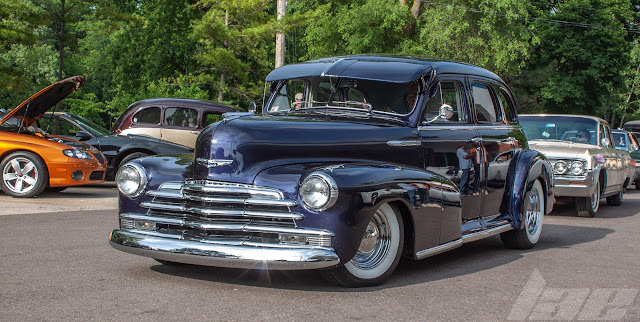 This color is called Quartz Blue Metallic. On the outside, this car is almost the same size as my 06 Forester. It's 1.4 inches shorter than my Forester, 1.8 inches wider, and 1.4 inches shorter (Stock height). 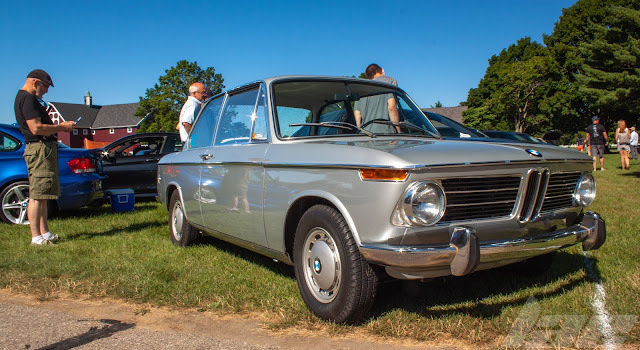 It also has 4.3 inches more wheelbase, which makes it a bit more stable on the Highway. Powered by a 148hp 2.0L H-4 Boxer engine mated to a 6-speed CVT transmission, this car is rated at 26mpg combined (the same as my 06). Like my 06, the Crosstrek has Symmetrical all-wheel-drive. 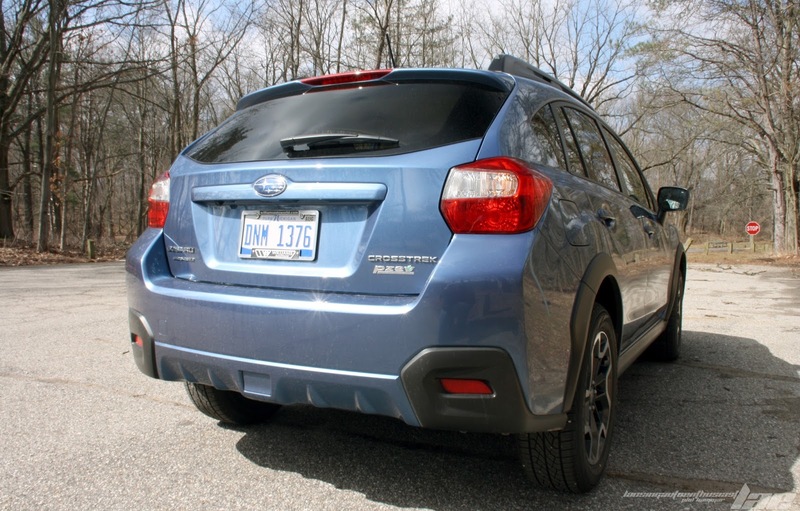 On the inside, the Crosstrek comes nicely equipped, much like most of the other cars I've reviewed. The center toucscreen interface controls the AM/FM/HD radio, Bluetooth, Pandora streaming, MP3 and CD playback, Hands-free phone and the 6-speaker audio system. 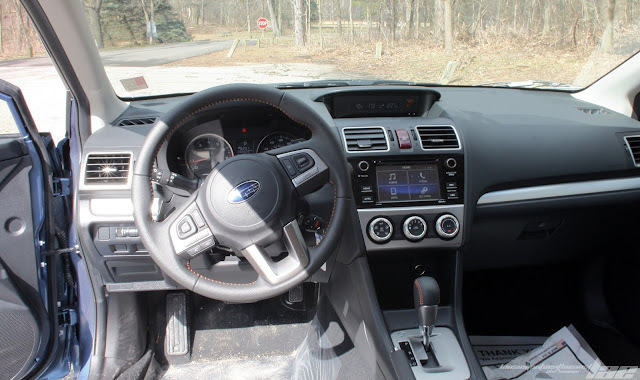 The HVAC knobs are large enough to use with gloves on, the steering wheel controls are simple and easy to use, and the steering wheel itself is nicely wrapped in leather, and held together with orange stitching. The dashboard is covered in a rubberized coating, giving it a quality feel. Much nicer than it's competition. Like my car, there's a 12V plug in the dash, ahead of the shifter, and another in the armrest, alongside an auxillary audio input and a USB port. There is decent legroom in the front. actually more so than in my Forester. The rear, though, loses a bit on the drivers side with the front seat adjusted for myself. The upholstery throughout has a nice design, and quality feel. My only complaint is that the light color will be difficult to keep clean. 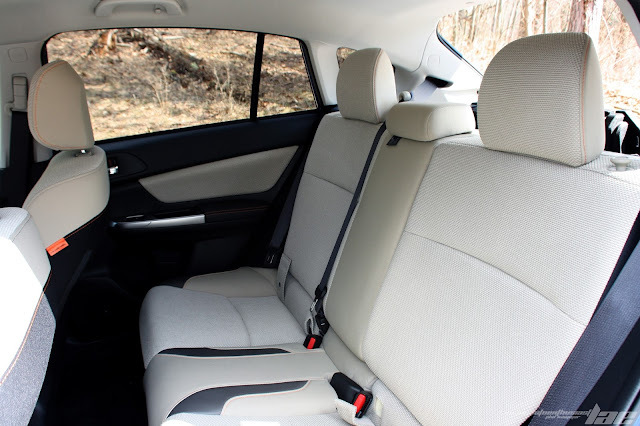 The rear cargo area is spacious with the seats up (22.3 Cubic Feet), and even more so with the 60/40 split folding rear seat folded down (51.9 cubic feet). For more information on this vehicle, check out Williams Subaru for more details. 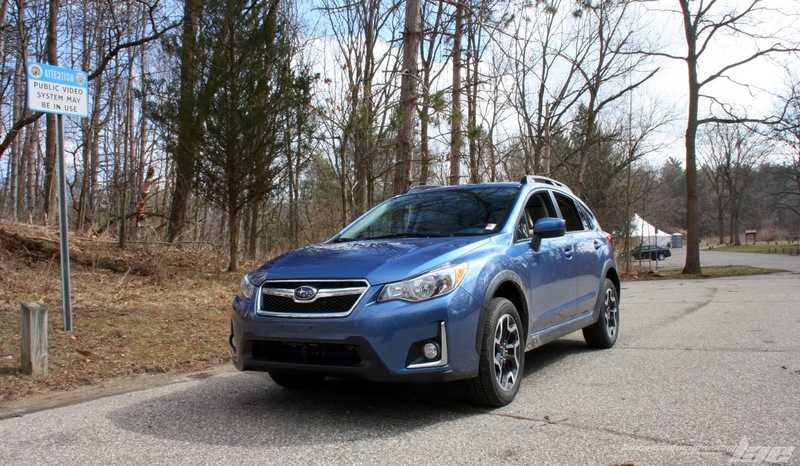 Also be sure to check out Subaru Americas' website for options and pricing. Keep checking back for a possible Video review coming soon. And remember, if you liked this post, remember to follow me here on Blogger, like my page on Facebook, follow me on Twitter and Instagram, and subscribe on Youtube.